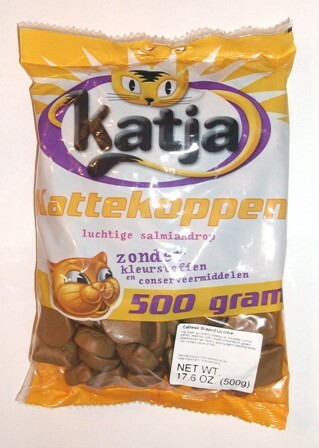 Katja Kattekoppen, soft cat face shaped licorice and lightly sweet, available in a 500g bag, which is slightly larger than 1 pound. These chewy tan licorice pieces have a soft and light texture. They have a lightly sweet salmiac flavor and are made in adorable cat face shapes!